One other Elder, an old Shieldbearer named Tarvek, volunteered, as did a trio of younger Sidereals. There was a momentary lull during which no one else volunteered, and then a younger Chosen of Endings who'd been absent up until then came running into the Loom chamber. "Chejop Kejak has passed away!" There was instant pandemonium in the chamber, over which the voices of the two Maidens could still somehow be heard. "We will take four Sidereals each," they said. Jupiter's voice dropped to a normal volume then, leaving only Saturn's to ring magically in the ears of the four she had chosen. "Shieldbearer. Harbinger. Joybringer," the Maiden of Ending's eyes turned to Xiangfan, then Lightning, and then Mistress as she addressed them. Saturn's voice changed slightly for the last title - but not enough to convey exactly what emotion accompanied it - as she locked eyes with Riita. "Reckoner." "Come." She turned on her heel and walked out of the Loom, leaving the Five-Score Fellowship to panic over the loss of their eldest. "All things End," Saturn said as she lead the four Sidereals to a nearby pagoda, her eyes fixed on the starry sky above. It wasn't exactly clear how she could still be in the lead when she wasn't even playing, but perhaps the other Incarnae were busy as well - or perhaps they simply hadn't overcome her lead yet? In any case, the Maiden of Endings didn't look worried. Her face was inscrutable as ever. They reached the pagoda, where a fifth Sidereal was waiting for them. Iselsi Sarat was a Chosen of Secrets, and looked about as confused as the rest of them as to why he was there. "It is time for Denandsor to be plundered. Though it pains my sister, the city's mystery must End." She turned to look at the five of them, robes whispering quietly around her. One hand reached out, holding an hourglass full of violet sand that shimmered strangely under the starlight. "Shieldbearer, this is for you. It will protect you and your companions from time. Break it over the cause of Denandsor's disquiet, and the disquiet will End." A tiny hand bell was next, its ringer carefully wrapped in cloth. "Joybringer, this is for you. Use it if the weight grows too much to bear." "Harbinger, this is for you." It was a blindfold made of silk, but violet rather than green like a Revelation Blindfold would be. "Use it to find the way when all paths have ended." Next was a small hand mirror. "Oracle, this is for you." She gave no other explanation as to its purpose or uses. Last was a violet prayer strip. "Reckoner. With this, you may ask of me one question. If it is within my power, I will answer it." She brushed past them then, her direction indicating a return to the Games. "You may tell no one the details of your mission, and take only little for yourself. The City's riches are not for Yu-Shan, but for Creation," she said, and started to walk away. Knotting the blindfold around her forehead, Lightning turned to her committee. "I shall arrange for transportation and vital supplies." Snapping off a salute, she blitzed toward the nearby canal in a flash of yellow Essence. Mistress vaguely remembered hearing about Denandsor. It was an ancient First Age manufacturing city, then called the City of the Makers, that had been abandoned around the time of the Great Contagion. It was known for its miasma, an aura of disquiet that hung over the city, filling all who entered with creeping dread that slowly transformed into utter terror. Some fled screaming, while others just disappeared, never to be seen again. An empty city, right? It sounded fairly easy. An hourglass that fixes time? I honestly don't know what else I was expecting, Xiangfan thought, accepting the hourglass with a bow. Timeline shenanigans aside, this was, at its core, about like most of his out-of-department work... vague objective, no directions, creative freedom. It was about how he liked it. Lightning was already off arranging transport, without the chance to say much else. Saturn had probably given them all the information she was going to. "So, I should probably get my gear, at the very least. I'll see what I can find about what we might be up against while I'm at it." Sarat gratefully accepts the mirror. He fiddles with it, looking it over in his hands, before settling it into a pocket. Shaking himself out of his own mind he looked around for his allies, only now noticing some had already left. "I guess we will regroup at the nearest Gate? I would like some time to expand my knowledge on the subject before we depart." He bows to the Maiden before calling a cloud from the sky. "I'll be in the Forbidden Manse of Ivy if I am needed." Upon reaching his offices Sarat takes a small nap to focus his mind (and use the Maiden's blessings). A flurry of research follows, focusing on the ancient city, its use in the First Age, and its possible defenses, while sparing some time for the mirror. ((Activating Methodology of Secrets for a +3 Lore Specialty in 'Denandsor'. When Sarat woke from his nap, his mind was aflame with knowledge. He immediately walked through the library, pulling out book after book, and flipped through pages, looking for what he needed. After a few hours of painstaking, almost-frustrating work (so much of the knowledge seemed to be on the tip of his tongue already), he had pieced together an incredibly detailed map of the city - based in equal parts on ancient tomes from the First Age, hidden nuggets of information from novels and plays set there, and half-forgotten glimpses from his own past incarnations. Red lines are inner and outer walls; the area in between is where many artistic squatters used to live. Black lines are major thoroughfares. Center circle is the Central Manse; to its south side are the gardens with koi ponds that sometimes shimmer with strange lights at night. Northeast quadrant is the Residential District, with the Sun Points possessing various palaces. Swankier apartments are closer to the palaces, with the vast low-rent barracks at the edges. Southeast quadrant is the Commercial District, museums and expensive stores in the Sun Points and lower-rent places/massive pre-fabbed seller stalls further out. Southwest quadrant is the Cemetary District. Tombs of various Exalted crafters (or their favorite concubines) are in the Sun Points. Less important people are buried out past that. 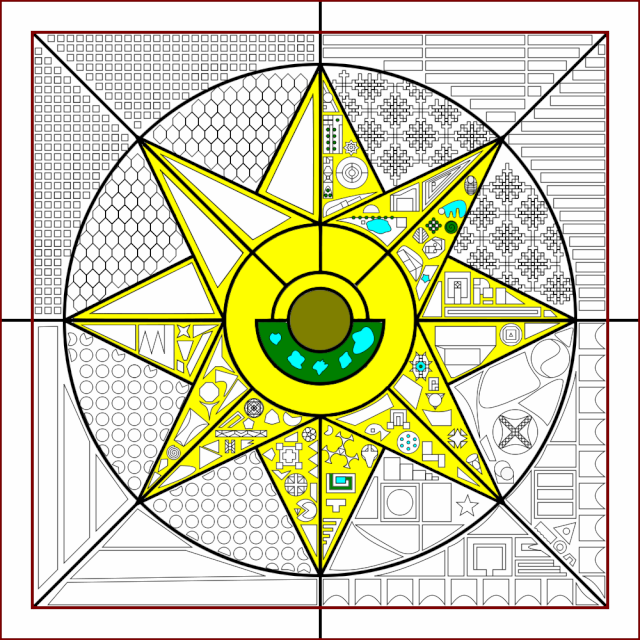 Northwest quadrant is the Industrial District; the vast big triangles are the four Factory-Cathedrals of Denandsor, while the "beehive" are the personalized workshops of most of the city's Dragon-Blooded or other talented supernatural workers. After that are the much smaller, low-rent workshops for mortals. Xiangfan's exit was much less flashy than Lightning's, as he simply hailed a cab and bound for home. Some minutes later, he arrived outside of his primary home, a modest manse of Sidereal aspect. There were bigger ones, and there were flashier ones, and there were many like it, but this one was his. He'd managed to fluke his way into it early on in his career, and since then he'd grown attached, though his salary could afford him a larger mundane dwelling. Koiwaii, his stewardess, poked her head out of her studio when he opened the door. "Xiang, I didn't expect you back home so soon. How was work?" He hung his coat by the door and poured himself a cold drink from a conveniently-placed pitcher. "About the usual. Bureau of Secrets is a whiny little ninny, insists on acting surprised when giving me creative freedom ends in decisive solutions, the timeflow of Creation looks like it got punched in the face by the Unconquered Sun, and Chejop Kejak is dead. What do you have going in the studio?" He sipped his drink and tried to peer past Koiwaii. "Don't look yet, it's not done!" she said, blocking him and putting a hand on the door jamb. "And you're just coming home after all that? I really doubt you're just here for a nap." "Yep. I'm out on assignment once I can get my stuff together. Mind taking a break for some transcriptions for me? I need to schmooze the pattern spiders." Koiwaii nodded. "Of course. Got any juicy details for me where you're going?" "I could tell you, but I'd have to kill you," he said with a knowing wink. "Got it, riiiight," Koiwaii said, rolling her eyes at the well-used in-joke. "Well sir, just bring me what you need when you're done with it. Your weapons are in their usual spot, and I've washed your other gear." "Thanks, Waii. Now if you'll excuse me..." he took a few dumplings on a plate and carried them to his bedroom. A few button presses on the wall started up some motivating music, made by instruments Xiang didn't recognize; the original maker had been a bit daft and had somehow managed to connect the manse's song library at least partially to some Wyld eddy, so what came out of the music system may not always be music that had been heard in Creation. Sitting down to work, he jotted down the parameters for a resplendent destiny under the ascending aspect of the Quiver. As he didn't intend to use it long-term, just milk it for whatever resplendencies it could give him, he took some liberties with the details. This one would be for an archaeologist from a nearby university, something of a crack treasure-hunter. Maybe with a whip... no, that would be too silly. A machete and a bow case would be more than sufficient both to pass off artifacts if he had to and serve as the requisite trappings to fit the part. Once done, he handed this to Koiwaii for transcription and gathered some basic traveling gear together with his essence cannon, ORA, with Cleaver tucked neatly into its tactical sheath on the weapon's side. A quick trip to the Loom dropped off Waii's neat-as-ever calligraphy with the Spiders, and following that, he went on his way to the Gate; however, one of Mistress' distinctive leather-clad manservants trying to catch up to him. Stopping the cab and taking the message, he returned home. His needs of supplies were minimal, and Lightning was presumably looking into traveling provisions, so he had little preparation he needed to do. So instead, he took the time to write up a new Destiny, this one a Lookshyan big game hunter, bearing a shield and sword, and carrying claws and teeth of his former prey on his belt. This he gave to Waii as well for neat transcription, and had a messenger send it to the Loom. He'd be up that night praying. After he was finished with his research, Sarat turned his attention to the mirror. Its essence sounded melancholy, as might be expected of something that had come from the Maiden of Endings, but as he listened he realized that it might not be something she'd created - just something that had been in her possession for a while. It was a wonder of great power, not so great as the greatest armors or weapons that Yu-Shan had in its armories but quite capable of having a large impact on the future of Creation. If attuned, the Oracle determined, it would probably show him Endings - though whether past, present, or future, he wasn't sure. Mistress saw her dispersing comrades and shrugged. There would be the matter of getting supplies ready for the journey, but that would be best handled just before they left. For now, she saw fit to spend the rest of today communing with those fickle servants of the loom, bashing her head against the wall as she repeats the same thing she always asks for, again and again, because they never write these things down to reuse with a minor tweak. With an audible sigh she began her march back to the loom, where she could rejoin her waiting rickshaw, and head home. On the relatively comfortable ride, she produced adequate paper and ink to scribble the basics she assumed the blasted arachnids would fail to read, discard, then complain about all the same. Herself used to taking sensitive action, with delicate precision, despite the amount of shuddering, shaking, and jostling she might otherwise be experiencing, the ride in the rickshaw posed no threat to her concentration, indeed, it might have helped. She always did her best thinking this way. Eventually, they arrived at her opulent residence. How she'd gained access to such an expensive structure from the moment she'd been whisked away to Yu-Shan was beyond both her, and her peers. Still, it was by all rights hers, and it let her lead a comfortable, and private, existence. Passing servants, she flagged down four who seemed the least busy, quickly scrawled out addresses and names, and sent them off, each to deliver the simple message "Meet at my manse tomorrow, midday creation time. We have a plan to discuss." to the waiting offices of her compatriots. Before she could begin, she realized, it would be prudent to garner some form of support for this matter. Fortunately, she had dealt with gods of her purview in the past, and this would hardly be a complicated matter. Making a quick prayer to Bears-Fifty-Lashes, whose duties including the punishing of slaves, she requested that he grant her his signature on a somewhat private matter. She was to be a wealthy slave-master, dealer in rented slave-labor. Figuring his authority on the matter would carry enough weight, opening a secret door in her innermost sanctum, she produced a wondrous pitcher of celestial wine, burning it softly in offering, slowly, letting the god savor the prayer slowly. Reminding him of but one of the many benefits that come from serving Mistress. The member 'AlaskanWyvern' has done the following action : Rolling for petitionings, in order. Happy with the map he had assembled, Sarat set it aside for Forsythia to make five copies. It always surprised him how remarkable her penmanship was for an Kestrel. The flower pot on his desk drew his attention. He never liked this part but knew it might be necessary. Pulling a prewritten prayer strip bearing the Scripture of That Old Thing from a drawer and burying deep in the dirt. A penknife provided the blood and an effort of will infused it and the strip with his Essence and Will before setting it in the light as it began to rapidly grow. Willing the bleeding to stop he returned to his desk and retrieved incense, which he set to burning, silk paper, and a pen. Over the next few hours he designed and requested a number of destinies for the up coming mission: a Dragon-blooded Scholar from the Realm (The Sorcerer), a wandering monk (The Mask), a man running from Thorns and looking for work (The Corpse), and a young woman from Great Forks searching for her place in life (The Rising Smoke). That finished, Sarat gathered the gear he might need: rope, torches, firedust explosives, emergency rations, and the like, slipping them all into various pockets. This left him free to infuse Saturn's gift in his Essence. Feeling the nature of the mirror fill and resonate with his Anima he looked deep into it, wondering what he would see. Activating Embracing Life Method (10m, 1wp, 1lhl) focusing on how to resolve the time issues. Rolling 4 prayer rolls. Each bought to target number 4 with the Fateful Excellency and +5 successes with the Second Excellency. Order is Sorcerer (16) (5 - Scope 2, Duration 1, Endurance 2), Mask (18) (5 - Scope 2, Duration 1, Endurance 2), Corpse (11) (7 - Scope 2, Duration 1, Endurance 4), Rising Smoke (19) (6 - Scope 2, Duration 1, Endurance 3). Riita stared at the prayer strip. Any question within the power of Saturn to answer? There were a few things that immediately came to mind. Did the maidens support the Usurpation? What made the Solars go insane? How can I teach Sidereal Martial Arts to Lunars? What Happened to the Scarlet Empress? Still, he didn't know if she knew or could even know the answers and if she did not know would he receive another question? If only it was a prayer strip to Jupiter! When he finally looked up, his new teammates were gone. He followed their example. There were requisition papers to fill out before he left, some for the time engines and some for a new resplendent destiny. An aged monk would be fine for travel; he could drop it inside the city itself. There wouldn't be anyone to see him besides his teammates. Sarat looked into the mirror, and at first, he saw only his own reflection. But, then the image shifted, and he was looking at a younger image of himself. He watched with a slight wince as the then-young Sidereal cut away the parts of himself needed to ascend to the Emerald Circle of Sorcery... and then the image shifted again to show him Ending another part of himself for the Sapphire Circle. It showed him more Endings from his life, concluding with the face of the last person he'd killed. The images began to flash faster and faster then. A young woman strapped to an altar screamed as a knife descended. Chejop Kejak twisted and fell to the ground in the middle of the street. A cloaked figure with purple eyes spread its cloak wide, revealing a sky full of stars, and an ivory-skinned demon covered in small toothy maws was pulled inside and undone. A young man became an old man in moments and collapsed, clutching at his chest. An empty city was surrounded by dark clouds that flashed with lightning and poured down rain outside the walls. Children played in a lush valley, but their motions became slower and slower until none of them moved. With wide and unblinking eyes Sarat stared at the mirror. Mentally calling on years of training and decades of experience he centered his mind. He searched for control of his Essence, forcing it into the walls around his mind and reached for destiny. Wrapping the cold certainty of death around his mind he pulled at the identity that bound the Corpse to him. A frayed thread of potential came loose and he wrapped himself in it. Now free, the mirror quickly disappeared into another pocket. Trying to shake the headache away he grabbed a bottle from a drawer and tried to forget the horror of loosing himself to the mirror. After an hour he had regained his normal demeanor and replaced the bottle. With a sigh he made his way to Forsythia's desk, retrieved and stored the maps, and headed to the Gate with her on his shoulder. Spending 1 endurance from the Corpse Resplendency on Dignity of the Dead.